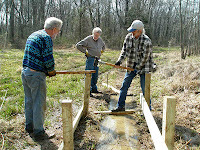 The Kingston Greenways Association is holding a Trails Day Work Session on Saturday, June 2, 2012, at 2 pm. This Trails Day will focus on the boardwalk in the Cook Natural Area. The main task will be to stack the boardwalk sections that washed away during last year's floods and to pry up the ones that are embedded. This work is in preparation for major repairs that will be undertaken later this year. Volunteers should meet in the Cook Area parking lot at the junction of Ridge Road, Heathcote Road and Division Street in Kingston. KGA provides gloves and tools. Sturdy, waterproof footwear is advised. To volunteer for this event, call David at 609-924-3399 or email tari at kingstongreenways.org. "Don't Crap Up My Book!"